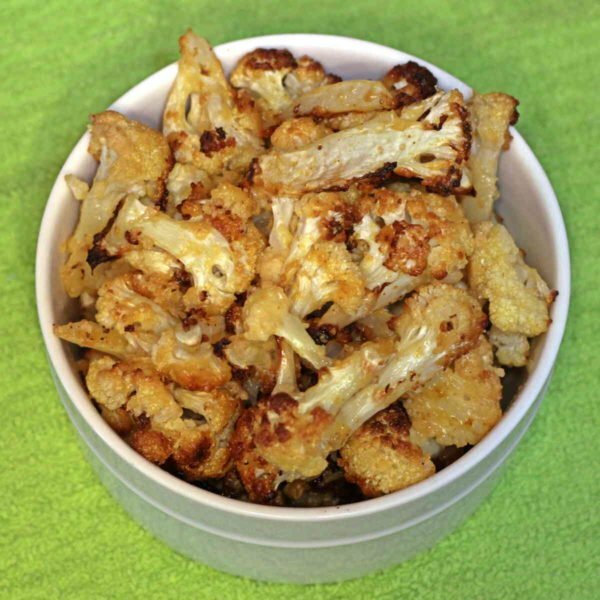 Meet my new favorite snack: Spicy Cauliflower with Parmesan Cheese. It’s quick and easy to make, with just a few minutes in the oven, and tastes just as good as it sounds. This recipe uses cayenne, garlic and onion powders and Lawry’s seasoned salt for the spicy part. You can adjust the amounts to taste, too. The way I make it is just mildly spicy, so add more if you prefer it hotter. 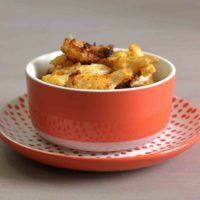 In the end, you have these little bite-size pieces of cauliflower that are coated in butter, parmesan, and spices, and they’ve been oven roasted until they are golden brown. I find it really hard to eat just one or two. But as snacks or side dishes go, it’s relatively healthy, depending on how you feel about butter. I think if you use grass-fed butter like Kerrygold, it tastes so much better. And it’s probably healthier than most margarine with soy oils and artificial ingredients. But you could certainly substitute a margarine if you want to. Just make sure it’s really got that butter flavor – that’s important to the recipe. I’ll make one other brand recommendation: I really like Kraft’s grated parmesan sprinkles for this. I’m normally a fan of generics and less expensive off-brands, and I use a lot of them. They’re often just as good as the top brands. But in this case, I’ve found not all grated parmesan is equal. Kraft just has more flavor than other brands and generics I’ve tried. 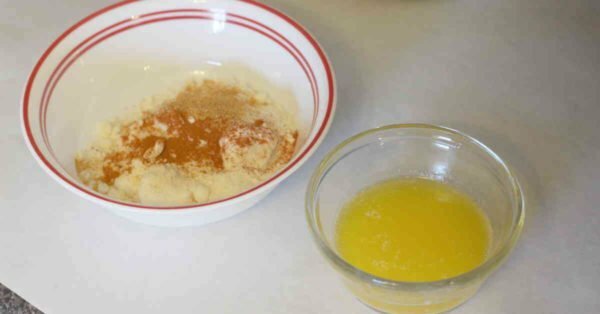 Then you melt your butter in one cup and mix your cheese and seasonings in a bowl. Stir up the cheese and seasonings until it’s all thoroughly mixed. 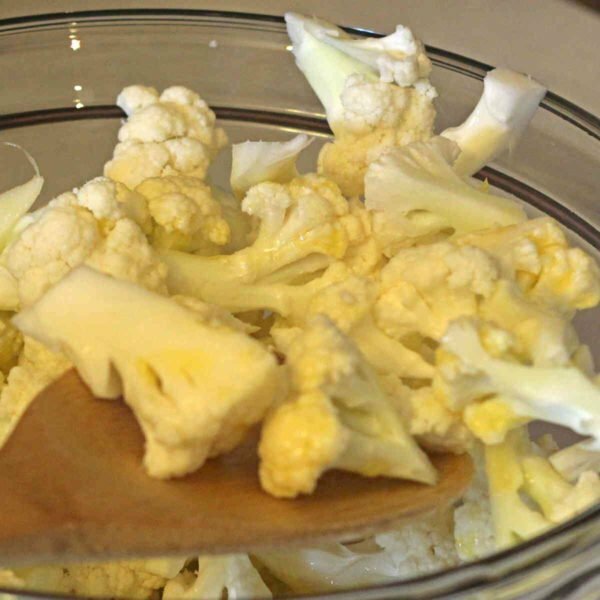 Now you want to drizzle the butter slowly over the cauliflower in its bowl, all the while tossing the cauliflower to get the butter evenly distributed. You can see in this next picture that all the cauliflower has a little bit of a golden hue from the butter. 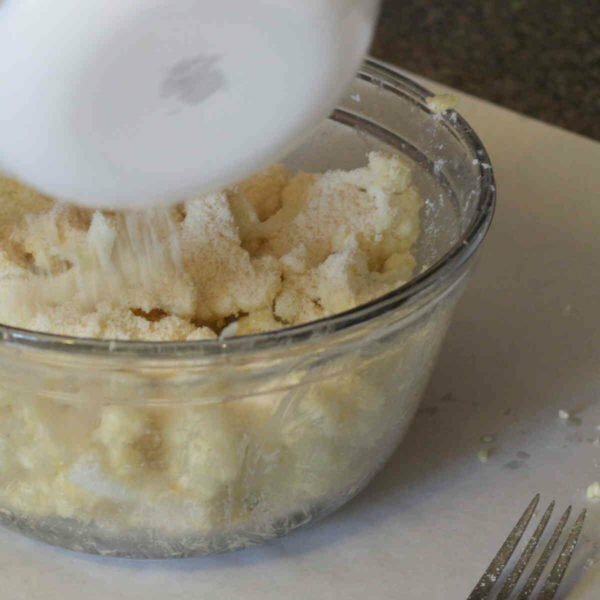 Next up, you want to slowly pour the cheese and powder mixture over the cauliflower – again, all while tossing the cauliflower so that it gets evenly distributed. 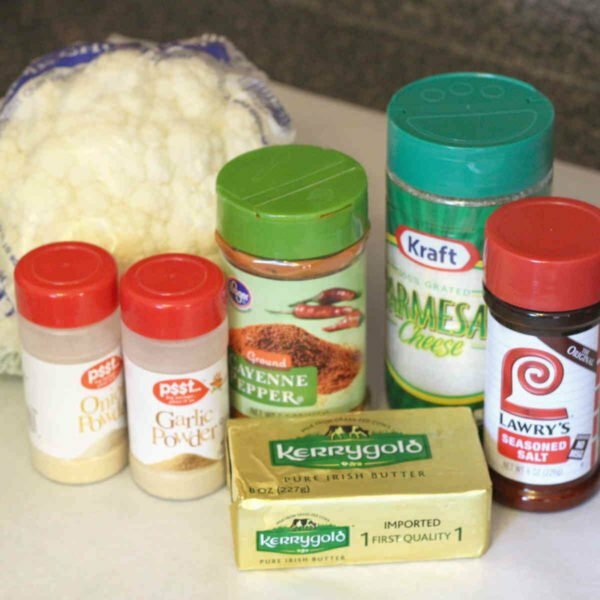 Now the cauliflower is evenly coated with butter cheese and seasonings. 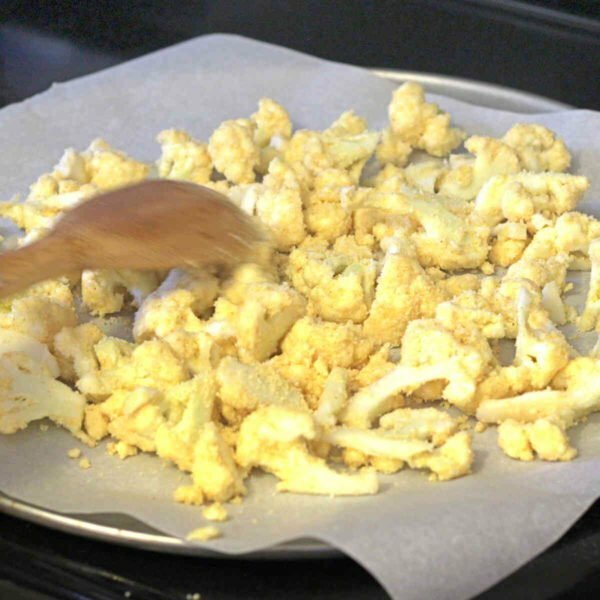 Cover a cookie sheet with aluminum foil and spread the cauliflower bites evenly over it. Pop that in an oven heated to 400° and let it bake for 15 to 20 minutes. The timing depends on the size of your cauliflower head and exactly how brown you want to let it get. But start checking it at 15 minutes and stop it when you think it’s the right shape golden brown. You can serve this as a snack, or as a side dish with my Red Sockeye Salmon Recipe. It also makes a great french fry substitute served alongside a good burger. 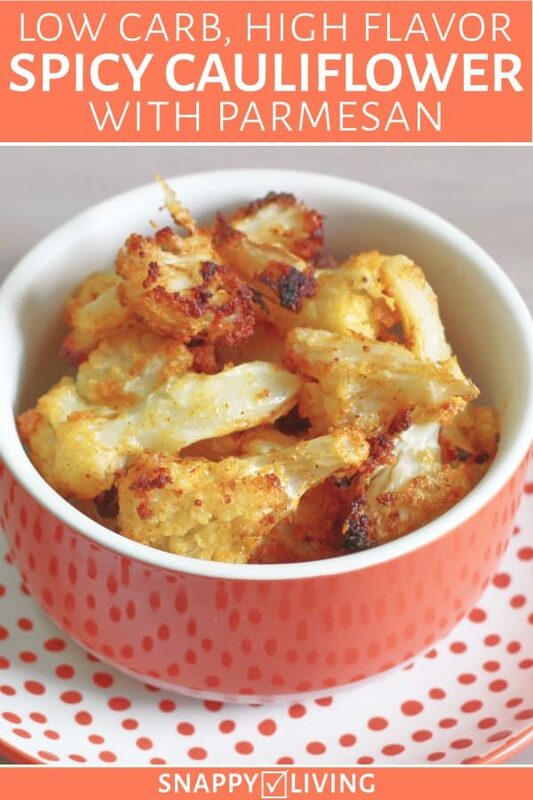 This delicious caulifower snack is just a tiny bit spicy, with a wonderful hint or garlic. 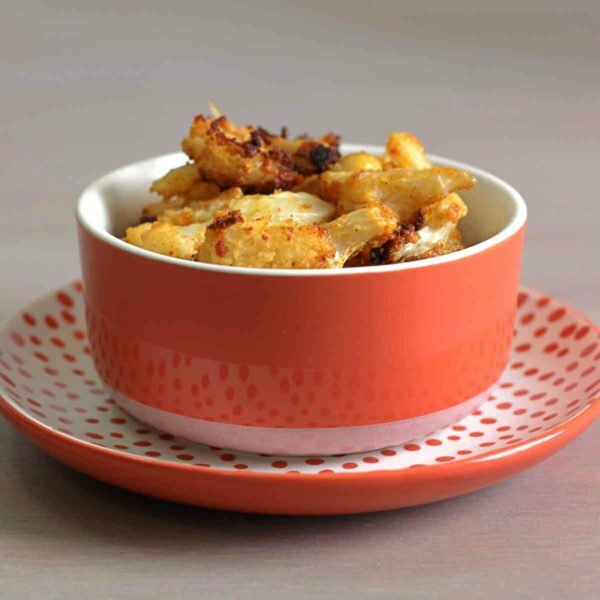 It's quick to make, and it works wonderfully as a finger food or a side dish. 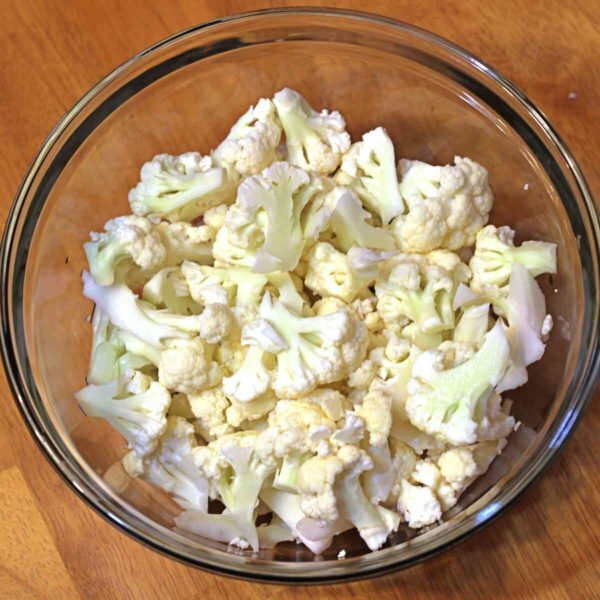 Cut your cauliflower into bite size pieces and put them in a bowl. Melt the butter in a cup. 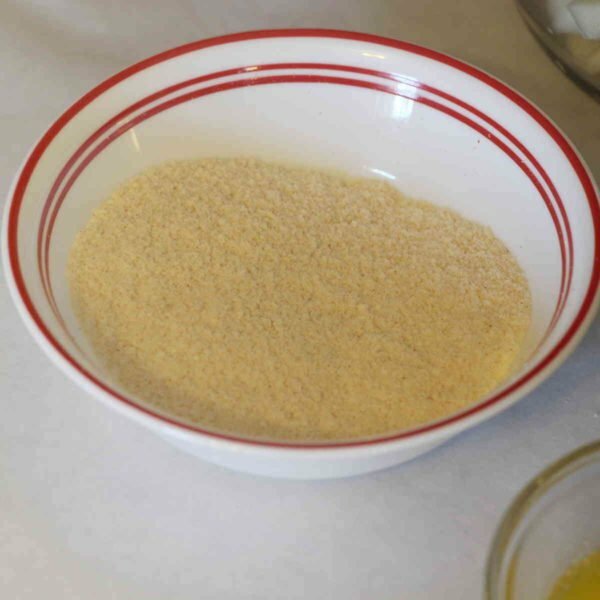 In another bowl, put your parmesan, Lawry’s, garlic powder and onion powder and stir them all together. 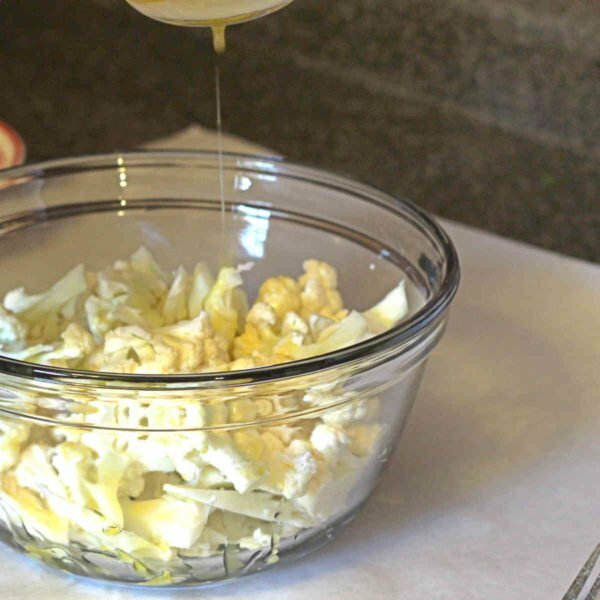 Drizzle melted butter over the cauliflower while tossing. Slowly pour the powder and cheese mixture over the cauliflower while tossing. 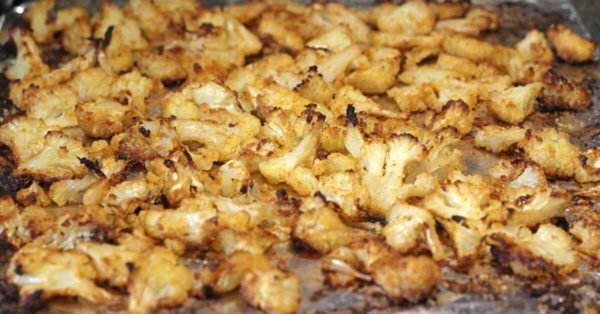 Spread the coated cauliflower out evenly on a cookie sheet covered with foil. Put it in an oven heated to 400° for 15-20 minutes, or until golden brown.